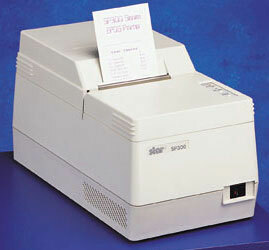 It is replaced by the Star SP700. The SP300 Series includes the SP322, one of the top receipt printers on the market. The Star SP322 (sprocket version for label printing and pre printed tickets) is suitable for PC-Point of Sale and restaurant systems. The stepping motor paper drive system has several advantages including quiet operation and adjustable line feed increment. This feature along with the cassette ribbon, offers a printer mechanism that is simple in design and virtually maintenance-free. Standard features include dual cash drawer drivers and single line validation. Impact, 4.2 lps, serial interface. Sprocket feed paper Includes power supply. Order cables separately. See accessories. Color: white. Impact, 4.2 lps, parallel interface. Sprocket feed paper Includes power supply. Order cables separately. See accessories. Color: white. Impact, 4.2 lps, parallel interface. Sprocket feed paper Includes power supply. Order cables separately. See accessories. Color: white. Also known as SP322SC40-120 US. Impact, 4.2 lps, serial interface. Sprocket feed paper Includes power supply. Order cables separately. See accessories. Color: white. Also known as SP322SD40-120 US. 3" width x 67' length, three-ply impact paper. 50 roll case.